A former teacher, counselor, and high school administrator, Marcia Rudoff has written essays for several magazines, newspapers, and anthologies. She is also the author of We have Stories: A handbook for writing your memoirs (2009). The book is a perfect start for anyone thinking of writing their life's story and not knowing where to begin. 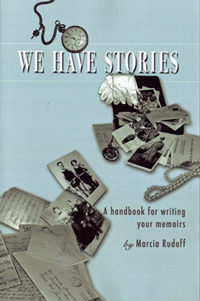 Rudoff currently leads a memoir writing group at the Bainbridge Island Senior Center. For more information about this author and her Memoir Club go to http://www.pnwlocalnews.com/kitsap/bir/entertainment/97115279.html. A copy of We have Stories is available in the Local Author's collection of the Bainbridge Public Library.